After trying lots kind of software to break a PDF password but failed, maybe you can have a try of PDF Password Cracker Pro v3.2. If you have the legal right to open a PDF file but you can not, please try this software.Say your old colleague has been left your company then you can not open the PDF file he had made. If you do not have the right to open it, considering no matter from law or morals we can not open it. Then I will show you how to use this software to beak higher level password. 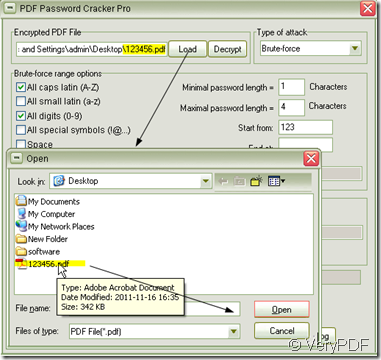 Visit PDF Password Cracker Pro v3.2 homepage. This software is quite easy to use. After free downloading, you can have a try of it. When the icon of this software show up on the desktop, double click it then you will enter the interface of this software. 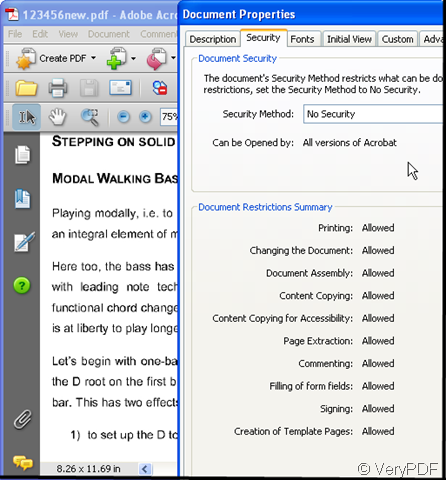 I will take a PDF file with open password and changing property password for example. The example file named 123456.pdf. When I open it, I will see the reminder like the picture shows. After inputting the password and checking the property, we can see like the following picture shows. 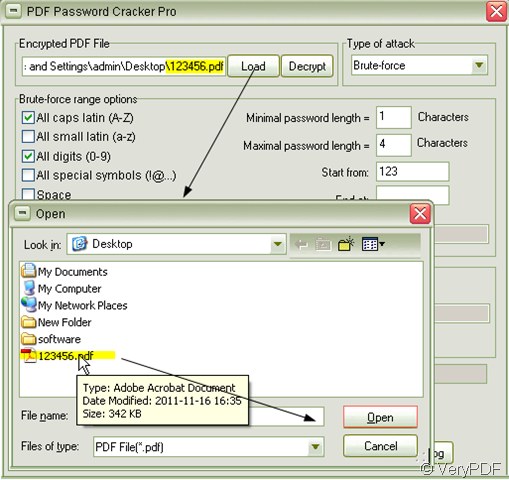 Add the PDF file to PDF Password Cracker Pro v3.2. Three ways to crake the password. If one way failed, you can try another. There is always one will be useful. Additional user dictionaries support, case changes, multiple mistypes and other modifications for each dictionary word and Program automatically saves password search state and can resume after a stop or a crash, so please trust its ability. 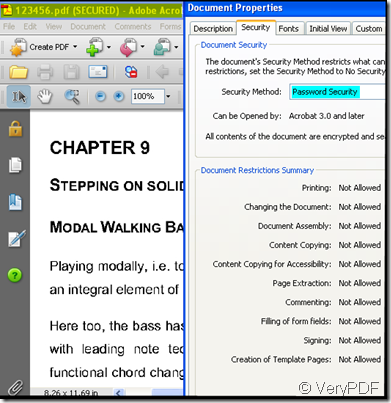 A few seconds later the PDF file will bounce to the screen automatically, through checking the property you can get whether you break the higher level password successfully or not. 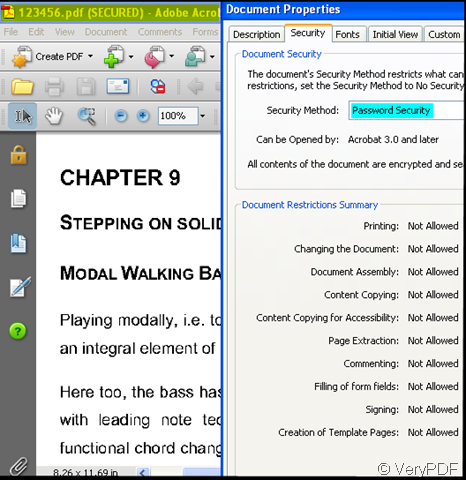 By this way, you can remove the PDF password no matter how difficult it is then you can use the PDF file freely. Convert pxl to bmp and set resolution via command line? 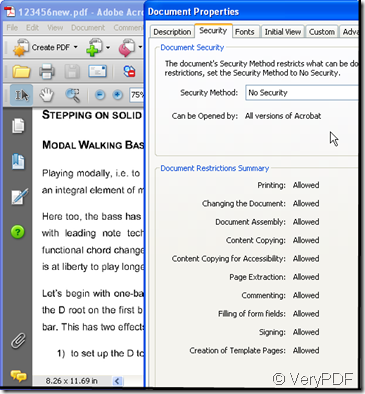 How to print PDF without Adobe Acrobat installed? This entry was posted in PDF Password Remover. Bookmark the permalink.